Mileage Calculation for Excel spreadsheet tracks mileage, tax deductions and reimbursements for travel or transport costs. Professional mileage reports can be created and printed including charts with deductible amounts, mileage and number of trips at specified frequencies. The mileage calculations update the reports automatically as new data is entered. Mileage Calculation for Excel reports can be customized with personal or company details are are suitable for tax purposes. The tax deductible mileage is documented properly to support deductions for official tax audits. Mileage Calculation for Excel allows the entering of start and end odometer reading values to automatically calculate the necessary report outputs. Monthly forms allow to specify mileage rate amounts for each trip category type and offers rate suggestions based on IRS allowable deductible rates. The spreadsheet includes help pages and links to tax documents for US, UK, and Canada. The help and links can be customized for particular requirements. 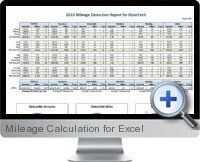 Mileage Calculation for Excel works with any version of Excel and is also compatible with Open Office Calc.